(NASHVILLE, Tenn. – May 20, 2016) The International Parking Institute (IPI) recognized 13 outstanding marketing and communications programs in the parking sector at the 2016 IPI Conference & Expo in Nashville, Tenn., today. The Parking Matters® Marketing and Communications awards program is designed to recognize outstanding parking related marketing, public relations, or communications programs and campaigns. Eligible programs use a wide spectrum of marketing tools, from advertising and public relations to collateral development, signage, special events, direct mail, video, and social media. Judges from IPI’s Parking Matters® Committee look for campaigns that help foster understanding of the importance of parking, knowledge and trends in parking, or awareness of parking best practices. Greenville Landmarks Wayfinding Art Competition, Greenville, S.C. The Tompkins County Commuter Challenge, Cornell University, Ithaca, N.Y.
All about the Bus Video, North Carolina State University, Raleigh, N.C.
We’ve Got a Spot for You Program, West New York Parking Authority, N.J.
Social Media Strategy, Philadelphia Parking Authority, Philadelphia, Pa.
Roundabouts Education, Stanford University Parking & Transportation Services, Stanford, Calif.
Communications Collaboration, University of Washington Transportation Services, Seattle, Wash. Mobile App Awareness Street Arcade, Passport, Boston, Mass. Parking Innovations Marketing Campaign, Montgomery County Government, Rockville, Md. 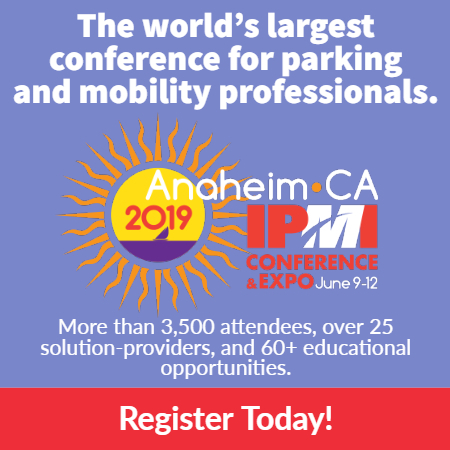 Details about each of the winning programs will be featured in the July issue of The Parking Professional, IPI’s monthly magazine. The Parking Matters® Marketing & Communications Awards will continue in 2017, with a call for entries being issued in August and a deadline for submissions in November, a few months earlier than in previous years.